Hi folks, Doc here. 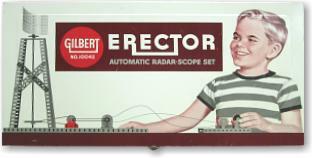 By 1959, traditional Gilbert Erector production had begun to wind down, influenced in part by rising production costs and a changing marketplace. 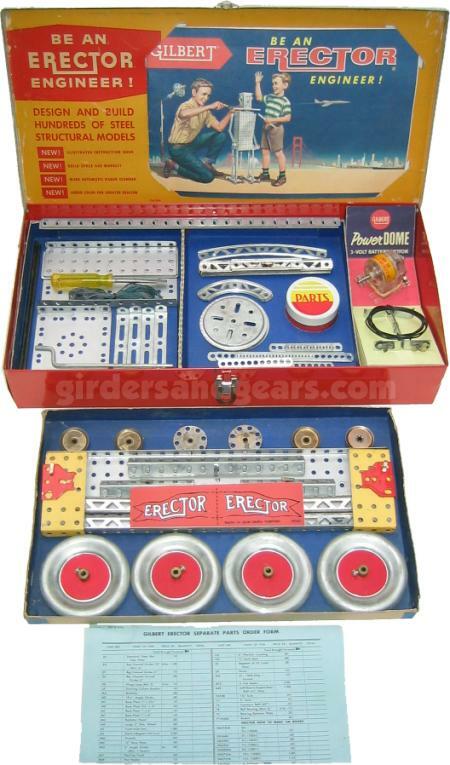 The post WWII "baby boomers" - of which yours truly is one - were still enjoying Erector sets just as generations before them had done, but the sets themselves had changed. 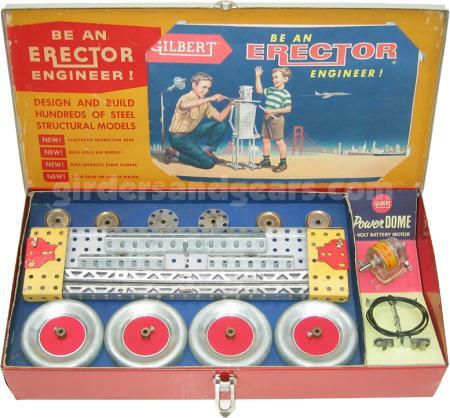 Two years earlier, in 1957, the A.C. Gilbert Company had made the first major changes to the packaging of Erector sets in over two decades. The boxes were now made from a thinner metal than in previous years. In addition, the solid red color on the boxes was gone, replaced by lithographed artwork. Inside the boxes, change was not always as evident at first. 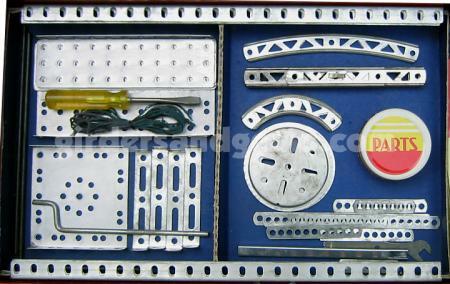 Parts were still arranged neatly, for the most part, in cardboard inserts and/or trays made from MN base plates. However, underneath those inserts in many sets the remainder of the parts were now gathered into plastic bags that were laid loosely in a cardboard tray: gone was the neatly organized second layer of parts in these sets. The set shown in this pictorial is a prime example of these packaging changes. The No. 10042 was the 1959 version of the older No. 4½/5½ set. They shared the same size box - 16" x 8" x 3" - and a similar selection of parts. One noticeable exception was the motor: by 1959 the 4½/5½'s A48 clockwork motor had given way to the (much maligned) 3 volt DC3 electric motor. Box artwork was elaborate and attractive, as shown in the image above. 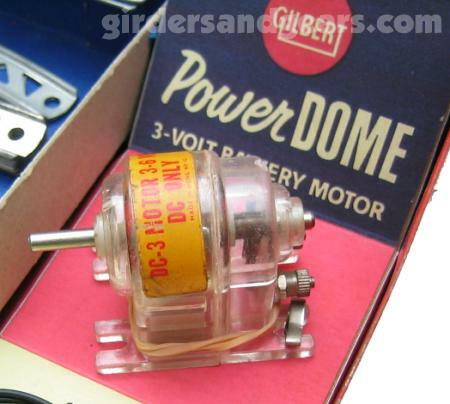 The instruction manual was stored inside the lid, a common feature in many of these later model sets. The set shown in this pictorial is from the early part of the 1959 product run, as indicated by the cardboard lid insert that held the manual; at mid-year, this insert was deleted, and the manual was attached to the lid with t-clips. 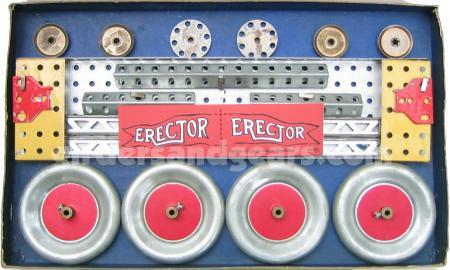 As shown, this particular set is almost all original, including nearly all of the parts, as well as the inserts (upper, lower, and lid) and manual. I did replace the motor, which was missing, and the printed motor insert, which I reproduced from a scan of an original piece.